By 2017, 83% of all online advertising will be purchased programmatically, according to eMarketer. Don’t get left behind. 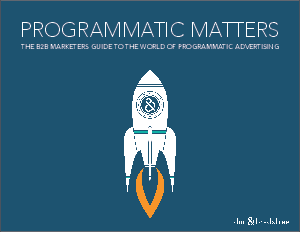 Download this informative eBook to learn why you should be investing in programmatic right now. Whether you're a beginner with a basic curiosity, or you have already executed a programmatic ad buy but you want to learn more, you'll discover exactly what programmatic is, why you need it, and how it works. Ultimately, you'll discover why Programmatic Matters.